Commercial quality beer bottle caps to keep your brew safe and sound from bottling day until you're ready to enjoy it. 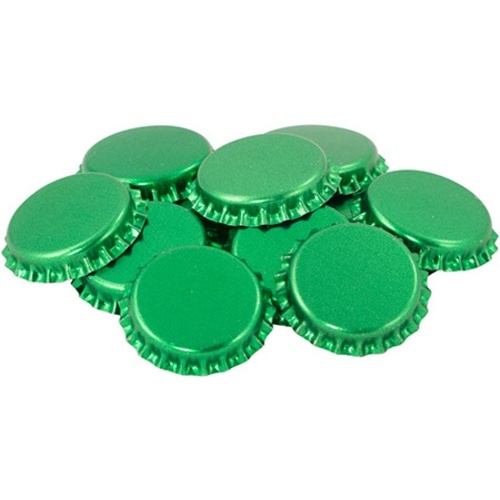 You will get a good firm seal that will last through transport, gift giving, and storage with these green bottle caps. These bottle caps crimp down onto the beer bottle and make a firm seal. They don’t rust or leak and they contain an Oxygen absorbing agent in the liner, which means you won’t get any unwanted oxidation. A good value for a great product. need caps and I like green. cause I ran out of bottle caps!! Good price and the color is eeeuugly. Hope it keeps my BIL out of my brew. Free shipping when I added this item. Typically keg but like to have caps on hand just in case. Good caps, easy to use. They do their job pretty well. Pretty easy to work with.